Ryan and The Cypress Room bartender Christian Carnevale working out the restaurant’s new Barrel Aged Spritz recipes earlier this week. For Michael, Miami Spice is what you make of it and The Cypress Room is taking this to heart beginning August 1 when it participates in the Greater Miami Convention & Visitors Bureau’s annual summer promotion for the second consecutive year, offering a Lunch (23) prix fixe Monday through Friday, and Dinner (39) Monday through Thursday, with the addition of supplemental midcourses and cocktails at special prices. 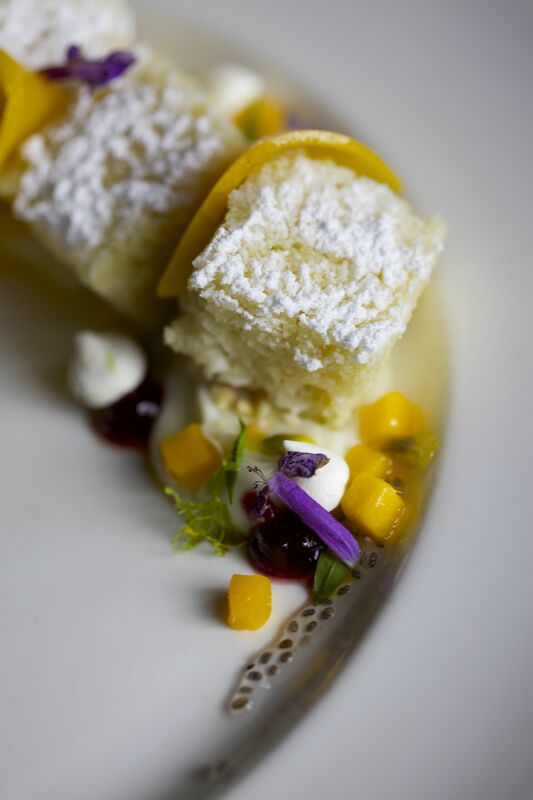 Hedy Goldsmith’s “Coconut” dessert on the Miami Spice Dinner menu, featuring local fruits of the summer season – fresh mango and passionfruit. For Lunch, Roel offers a first course choice of Tartine of Vegetable Escabeche with avocado mousse and radishes, Beet and Stone Fruit Salad with fontina, or Smoked Local Fish with mixed grains and bitter greens; midcourse supplements at a special price of Royal Red Shrimp with coconut, lime and puffed rice (10), Beef Tartare with truffle vinaigrette, potato chip, and pickled mushroom (9), and Tortellini with rabbit, spinach and parmigiano (8); second course options of The Cypress Burger with onion marmalade and Jasper Hill Landaff, Salt Cod with black bomba rice and saffron aioli, or Poussin with long bean almondine and glazed pearl onions; and the predicament of selecting amongst executive pastry chef Hedy Goldsmith’s finely-spun desserts including Floating Island with passion fruit and pistachio or Chocolate with Panther Coffee espresso and tart cherry pâté de fruit. Dinner brings a first course choice of Vichysoisse with arugula pesto and American caviar, Stone Fruit with charred bread, farmer cheese, pine nuts and herbs, or Oxtail Terrine with pickles; midcourse supplements at a special price of Lamb Tartare with quail egg and toast (15), Marrow Bone with preserved lemon, celery, and garlic toast (12), and Risotto with seasonal vegetables (11); second course options of The Cypress Burger with onion marmalade, Jasper Hill Landaff, and thrice cooked fries, Local Fish with kale purée, shaved zucchini, and anchovy butter, Rabbit Minestrone with chili oil and sourdough, or Porchetta alla Romana with salsa verde and green salad; and Goldsmith’s sweet finish of Coconut Cake with white chocolate crémeaux, mango, passion fruit, and lime meringue or Chocolate and Caramel Torte with candied peanuts. 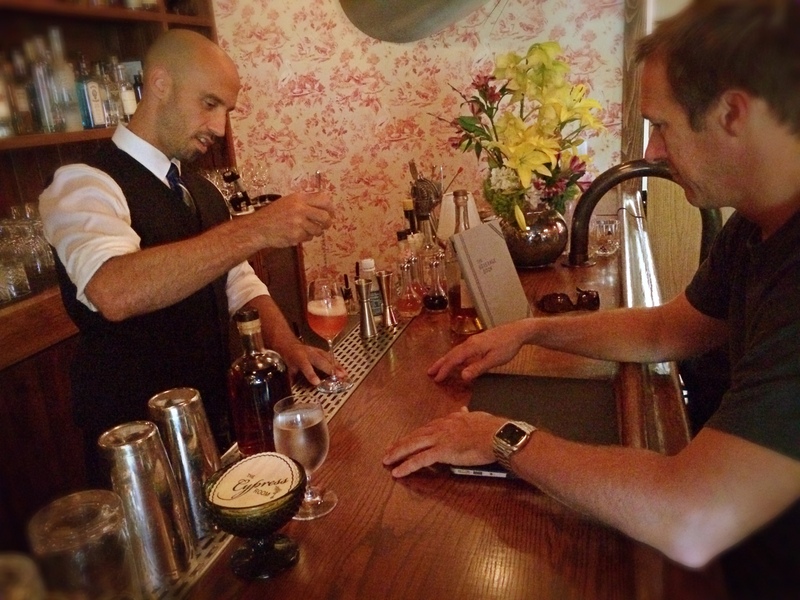 Ryan delivers fancy new Spritz glassware to the delight of lunchtime bartender Noelle Service yesterday. For the first time, the restaurant’s Miami Spice menus will include a printed special section of Barrel Aged Spritzes for $9 each, beverage director Ryan Goodspeed’s light twist on his cask program. 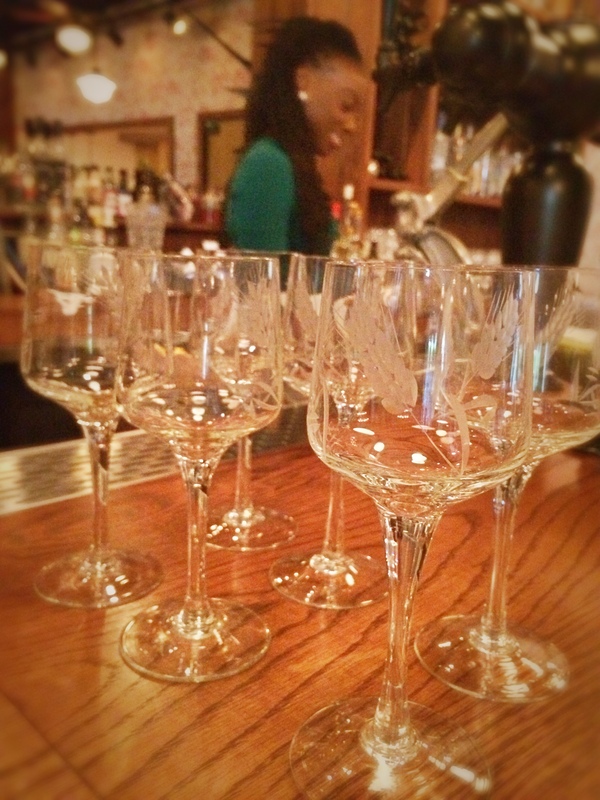 Each of the four drinks – Old Pal, Pomme Charmé, Bonnie & Clyde, and Viuex Carré – are made to order, served up in an etched cocktail glass with a couple of Kold Draft ice cubes. The Cypress Room Miami Spice begins Friday, August 1, and runs Monday through Friday for Lunch at $23 and through Thursday for Dinner at $39. Menus are updated daily and subject to change online at thecypressroom.com, and customers should expect items to change often. Follow the restaurant on Instagram and Twitter @thecypressroom and hashtag #ilovemiamispice for regular posts of what’s new. The restaurant is located at 3620 Northeast Second Avenue in Miami’s Design District. Reservations recommended by calling 305.520.5197 or emailing reservations@thecypressroom.com.